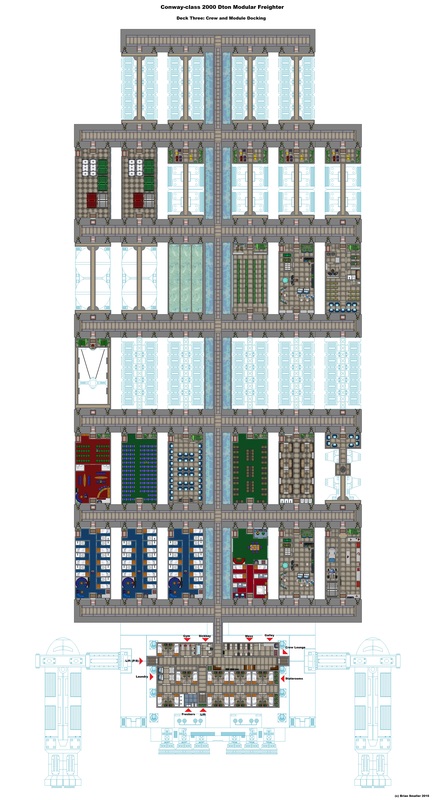 Finally got the first of my big freighter deck plans finished. This vessel is designed to carry 30Dton cutter modules over interstellar distances. It is built at Tech Level 12 and is capable of Jump 2. Maximum acceleration is 1G. It has a crew of thirty officers and men. It can carry 34 modules in dedicated docking ports plus 2 more in the two 50 Dton Modular Cutters. It also has a docking bay for two 20 Dton Launches. It also has hanger space for four small Cargo Tugs used for maneuvering modules into position. It is armed with eight laser turrets and two sand-caster turrets, all controlled from the bridge. Bridge Deck: Contains the bridge, main computer and the Captain’s quarters and office. 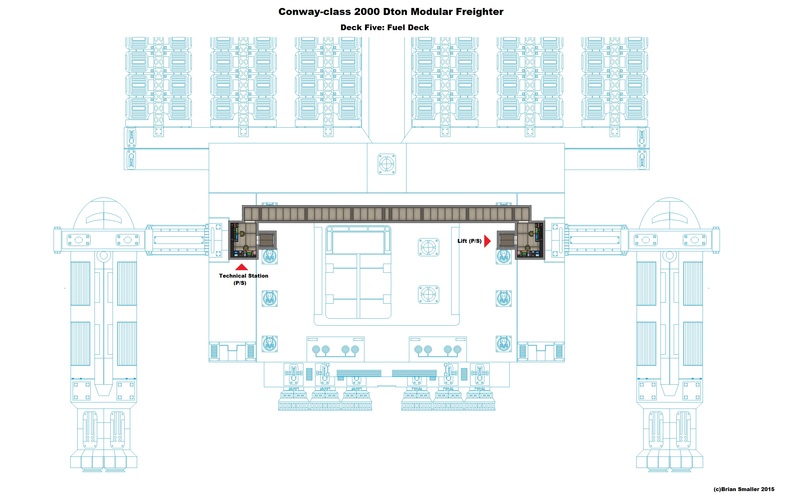 A lift connects with Decks B and C.
Officer’s Accommodation: Staterooms for eleven officers and their wardroom. Lift connects with A (Bridge) and C (Crew) Decks. 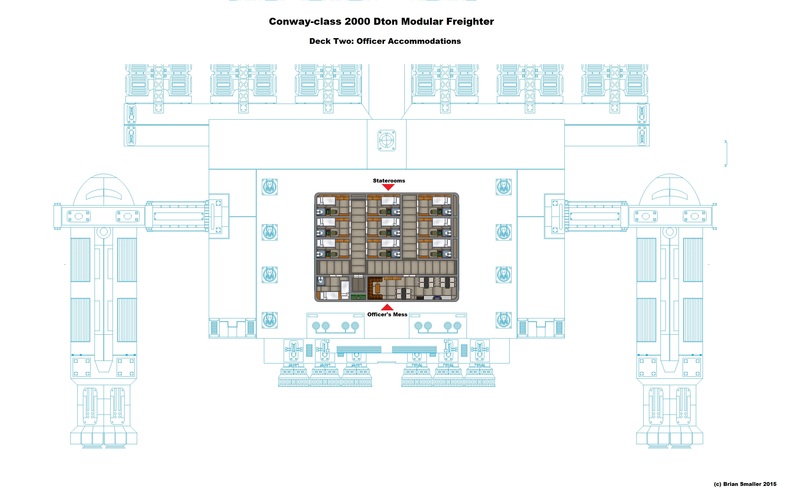 Crew Quarters: Staterooms and facilities for the rest of the crew. This deck also has the main access to the module docking spine. The spine also contains fuel tanks. Modules only have access to the docking arms via their top deck airlocks. 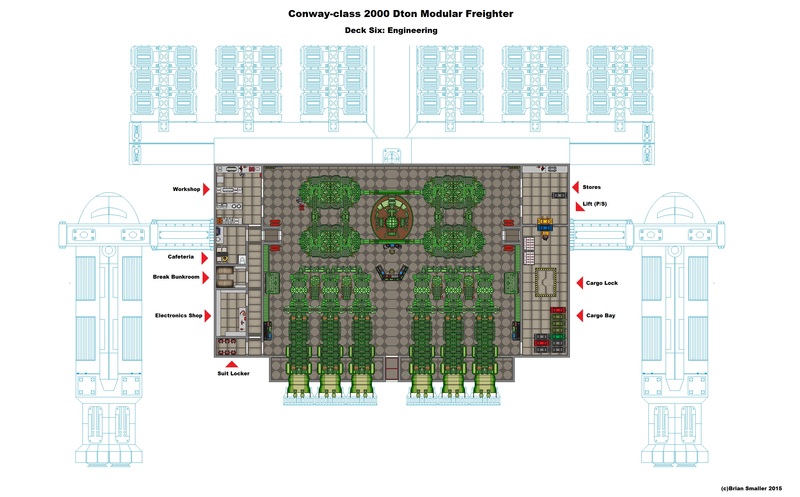 This deckplan shows a variety of modules – I mean I had to use all those deck plans I already had prepared (see here and here for for full plans for the modules shown). A Lift connects with B and A Deck. Port and Starboard are lifts that connect with all decks below this deck. Boat Deck: Docking for the two 50-Dton cutters, two 20 Dton Launches and four Cargo Bugs. Also two small internal cargo bays. Port and Starboard lifts connect with C (Crew) Deck and lower decks. Fuel Deck: Apart from a gangway, lift access and two fuel monitoring stations this deck is entirely given over to fuel storage. Engineering: This deck contains drives and power plants. Also the workshops and stores required to keep the vessel running. Additional Cargo space is located here for small volume cargo, accessed through a cargo lock in the ship’s belly. Brian, great plan as always, but I have a few questions. How high is the cargo hold on the engineering deck? What is it’s tonnage? Have you considered switching the fuel deck and the engineering deck, so that the thrust is more centered to the mass? If you do this, you can put in a sideways cargo hatch/lock into the engineering cargo bay. Other than that, and wanting to know the complete stats and crew makeup of the ship, I love this. Your creativity and design skills are awesome. Thanks for all the work you do for the game. There is always a critic 🙂 I kind of figured that the cargo space (and workshop sides on the other side of the Engineering deck) would have been a bit more than standard. The actual Engineering deck itself I imagine to be quite high – at least three times that of standard decks. Make sense? I might look at the changes you suggest for another model of this vessel. See my In-System Dual Module hauler for how easy it is to come up with a Really Bad (Tm) design. Do you have the ship design in High Guard Format with MT info detail? 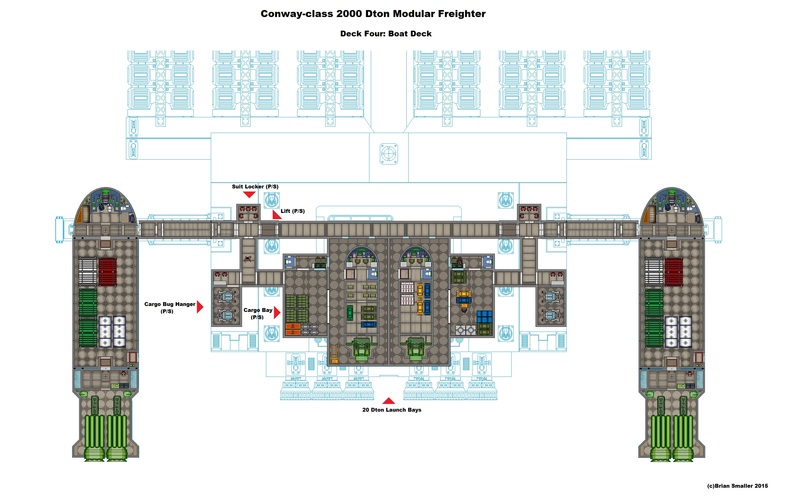 I think this is a very good module freighter. 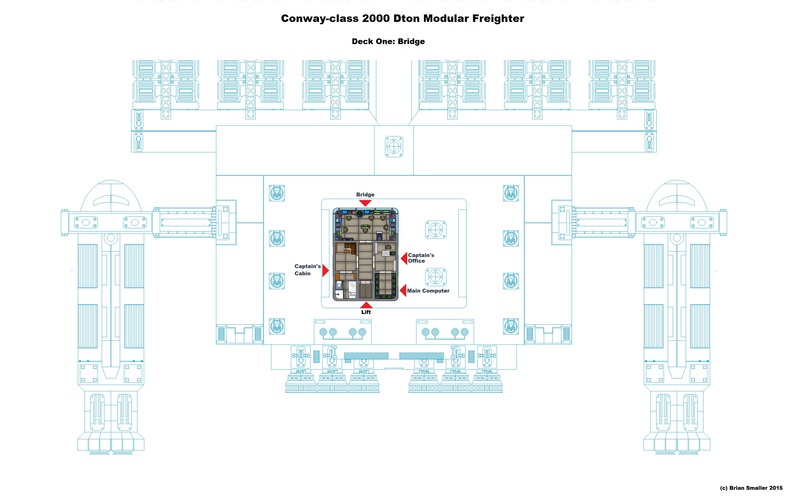 I think you were right on the money taking the 30 Dton module cutter module to be a set standard freight module. But perhaps take this design ever bigger. 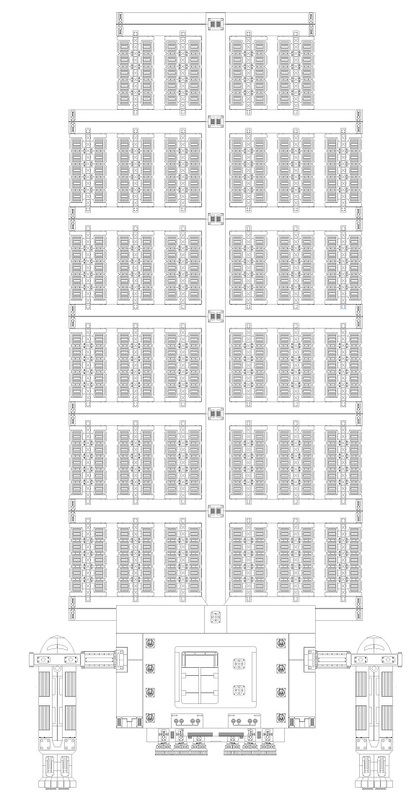 To carry not 34 but rather 680… Such the large MegaCorp in the Core sector would use to move materials in bulk. Just enlarge the Jdrive and and Six Huge Re-fullers to act as the J-Tanks for the ship and when it arrives in system they go fill up in sea or GG. Thanks Clifford. Good idea – but I am not mapping that in this scale 🙂 I don’t have the MegaTraveller stats. I assume you mean that and not MgT (Mongoose Traveller).